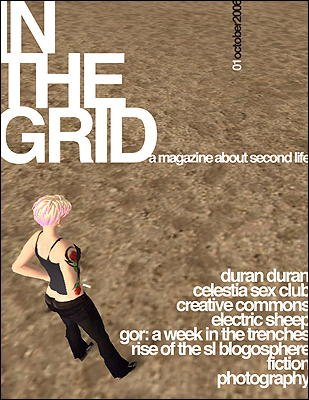 In our continuing efforts to improve the Second Life experience, we will update the Second Life grid on Monday October 24, 2005 from 6:00 AM PT to 2:00 PM PT. During that time Second Life will be unavailable. * The simulator now attempts to run at a fixed frame rate (45 frames per second) which is the same as the physics frame rate. This means that if there are a large number of scripts on the simulator, the frame rate will stay the same, but all of the scripts will run less frequently/slower, improving overall performance. * Major redesign of the way objects are transmitted from the simulator to the viewer. * Most inventory operations (move, delete, drop in world) can now be done on multiple inventory items at a time. * Ctrl-Click & Shift-Click are both supported. * Attachments appear in the Users Heads-Up-Display (HUD) and not in the world. * These attachments can only be seen by the person wearing them, not by other residents. * Full-bright objects/faces/textures do not give off light in local lighting mode but appear lit. * More details for each square tile. World map shows satellite view of objects in color. * Less server load to generate the map. * Auto-complete when typing in estate name, landmarks and friends online. * Removed the drop-down list from the Map Region Box, because it has too many regions in it for a menu. – Residents can no longer be negatively rated. Old negative ratings have been removed. – The land sale tool has been reorganized. * Land can no longer be sold for L$ 0 to anyone. You must set it for sale for a specific person. * More intuitive way of opening boxes. * Only available when object is rezzed in-world (replaces ‘Rate’ on pie menu when right-clicking an object). * Replaces using “Edit” window to view object contents and unpack boxes. * Future updates to http://secondlife.com/ will enable items selected for publishing to appear there. – Residents can create classified ads in the “Profile” window. * Ability to advertise for a fee; includes image, location & information. – View->Leaders has been removed. * See the SecondLife website for Leader information. * Admin and Power Users are still required to install Second Life. – The behavior for music player has changed. * If you click play, music will begin playing and will autoplay when you enter a parcel with music. If you click stop, music will stop and will not autoplay. * Users can now set the default pay price and the quick pay button values via the script llSetPayPrice function. * Added DATA_SIM_RATING to query the rating (PG or MATURE or UNKNOWN) of a simulator. * Gives users the ability to get the type of an inventory item. * Attachments can now be scripted to rotate and move. * These functions can be used to handle URLs. Spaces can be escaped to “%20” for example. * TargetOmega rotation no longer stops on selection.